The following circuit shows about Water Switch Sensor circuit based on the S201S02 IC. Features: two closely spaced metal rings are used as the water sensor mechanism. water circuit switch sensor can be used as applications for: rain alarm, watertap leak detectors, water level sensors for bathroom water heaters, wetness checker for flower pots and more. 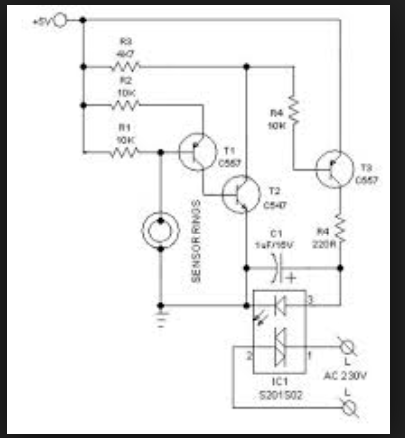 Working principle of this circuit is very simple. When the sensor rings are bridged by water, an isolated electric switch turns on to activate the load (an alarm, for instance) connected through its switching contacts. Here, the renowned S201S02 solid-state relay (IC1) is wired as the electronic switch.